Pressure equipments for the storage and transportation of industrial gas, mainly pressure bottles, have to be tested beside its first test before they go into service, also periodically according their mechanical integrity. Beside a visual inspection these repetition tests have to be performed by hydraulic pressure tests till to 1.5 times of the design pressure. Beside all other logistical troubles for the gas supply industry, which performs normally these tests, adjoining these tests the residual humidity causes a lot of problems for the owner/user especially for gas with a high purity. These tests may introduce also safety problems like corrosion and/or even hydrogen induced cracking into the bottles. Therefore a more accurate and safer testing method, like the performance of a gas pressure tests monitored with Acoustic Emission, shall replace the conventional method . This kind of testing represents a big advantage, but compared to the conventional test procedures, it needs a high sophisticated AE-test equipment, high educated test personnel and a well prepared test specification based on an AE-data base. This restricts their use to specific applications. Furthermore the situation of the normal testing department in the gas supply companies don't allow any change in the testing concept. The erection of a new test- and filling station allows a complete new concept, which could be established during the design of the testing house. Before the new test bench could be designed and erected the following questions have to be answered. How the test-bench (filling-and testing-part together with the host-computer) has to be designed to guarantee a safe test. with artificially produced cracks (fatigue crack created by notches and adjoining cycling of the bottles). The bottles would be tested till to their burst pressure and the AE data set were collected with two sensors, one on each end of the bottles. Based on previous investigations we and other AE user found out, that the worst case for the AE are the fatigue crack compared to all other possible defects in the bottles including corrosion [2,3]. Therefore most of the tests were carried out with such defects. For this type of defects we have to take into account, that such defects don't produce an increase of the AE-activity or, that this information occurs to late, because the defect is still critical. But in contrary we can expect only few high amplitude AE signals . We produced gas storage bottles with different notches. After the establishment of the loading (accessories and pressurisation rate) on normal, defect free pressure bottles, the bottles with the notches have been cycled till to the crack initiation. The predicted burst pressure should be in the range between the design and the test pressure. During the tests the bottles were equipped with two AE sensors, one on each end of the cylindrical part and the AE would be acquired during the whole test period (picture 1). Most of these bottles were pressurised till to the burst (picture 2). After a learning period the AE results showed, that the burst could be predicted properly for new and old injured bottles. The pre-warning time for the automatic program has been in the worst case 4 min, which allows a safe depressurisation of the bottles, much more because the resulting stop criteria are so strict, that the bottles are still in a sub-critical situation. The stop- and rejection criteria for the defective pressure bottles became established and validated . The results showed, that it is an absolute necessity to locate the defects, as a very important filter criteria against other noise-sources within this pressure bottles (picture 3). For this reason further tests with during the visual examination rejected bottles and such with support rings were performed. The results showed different location and characteristic, even for the stop criteria, but could be distinguished easily one from the other. Further tests on corroded bottles could demonstrate the ability of the detection of such defects very easily compared to the fatigue cracks (picture 4 and 5). fixed stop- and evaluation criteria depending on the type of bottles. In the semi-automatically test bench 12 pressure bottles shall be tested parallel with the storage medium. The pressurisation will be done with the pre-defined rate of 5 bar.min-1 from 60 % till to 130 % of the design pressure. During this time the AE signals were acquired and evaluated directly by the AE-equipment without any interference by the test personnel itself. If the tests run properly no further action become necessary. In the case ,if any of the tested bottles reach the stop criteria, the pressurisation will be stopped immediately by the host-computer and a safety relief valve will be opened and all bottles will be de-pressurised. After reaching the safe condition the test-personnel enter the bunker and take out the defective bottle and replace it in the test bench by a new one. The test can be continued. During the pressurisation of the bottles in the second chamber 12 further bottles will be equipped and the proper action of the equipment will be checked. Only if the position of the sensor and the sensitivity is correct, the host computer gives the next test phase free. The test pressure will be held for a period of 10 min and afterwards the filling will be reduced down to the normal working pressure and no further actions, like emptying, draining and filling with the stock product are necessary. The bottles can go into service till to the next necessary repetition tests. The stop and rejection criteria was established during the test phase and shall be improved permanently according the gained result and experiences. At the beginning the criteria have to be established very conservative and at the safe side. With more and more experience the rules can be defined more accurate. You have to take into account, that the personnel cannot interfere into the test-procedure and every step of it can only be started, if the forward action was accepted by the host-computer. Changes of the procedure and much more also from the stop- and rejection criteria have to be done by the responsible man and have to be adopted by the responsible test agency. Due to the fact, that the normal allowed pneumatic test pressure is only 110 % of the design pressure, this kind of testing has to be proven by the governmental authority and the action has to be demonstrated. During such a run in phase the complete AE equipment and all actions have to be checked. All these actions show clearly that the complete logistic has to be changed compared to the normal conventional testing procedure, because this test is also now the last point of the complete testing and filling procedure. The assertion of a hydrotest is "leaky or not" and sometimes in extremes "burst". Even when the pressure equipment will be injured during the pressure test, the test crew get no information about it. In contrary the AET has as a NDT method the capability to detect defects also within the microstructure of material and is therefore able to make a prediction about the probable behaviour of the structure till to the next repetition test. Based on the data storage of the complete test it's possible to compare the result and even raw data of two consecutive tests. This means the history of each pressure bottles is available. From the safety side the replacement of the hydrotest is an advantage in anyway, because no humidity will be introduced within the pressure equipment. 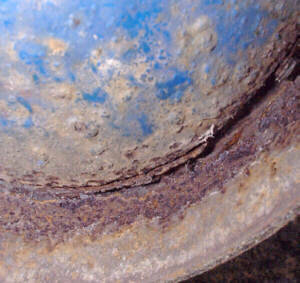 This reduces meaningful the possibility of any corrosion within the structure. Protection of the environment because the stock product is also the test medium. The conventional repetition tests for gas pressure bottles (hydrotest and visual inspection) produce a lot of troubles for the user and give you no information about integrity of the pressure equipment for the next service period. 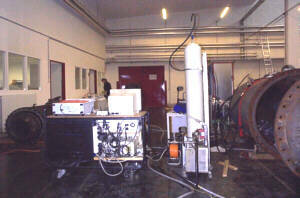 In conclusion with a new test bench Messer Austria decided to replace this testing method by a gas pressure test with the stock product monitored with Acoustic Emission. Because these tests shall be performed by the normal test personnel the complete testing, including loading, stop- and rejection criteria, have to be done automatically by the AE test equipment together with the host computer of the test bench. The TÜV Austria got the duty to develop the procedure for the tests and to establish safe stop- and rejection criteria. For this aim a lot of pre-tests had been performed. During these pre-tests also the requirements for the AE equipment and specially the adjoining soft-ware were determined. reduce the troubles for the customer from the logistic and economic side.